To launch our CanadaVet December of Facebook promotions and competitions in celebration of our page reaching 1000 friends, we are running a Spot-the-Difference competition with 10 Gripper Balls to be won! To enter, simply follow the link below, click the Like button on the photo and then tell us one of the ten differences in the two photos that you have found in the comments section below it. Be the first to spot one of the differences and we will send you a free Gripper Ball. There are 10 to be won in total! Good luck! 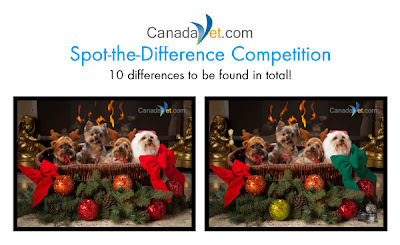 Click here to enter the CanadaVet Spot-the-Difference competition.